THE MAGIC WOVEN into the Ford pavilion at the New York World's Fair by Walt Disney and his "Imagines" cast its spell on many a Fairgoer, last year, and in its second season is due to enrapture many millions more. 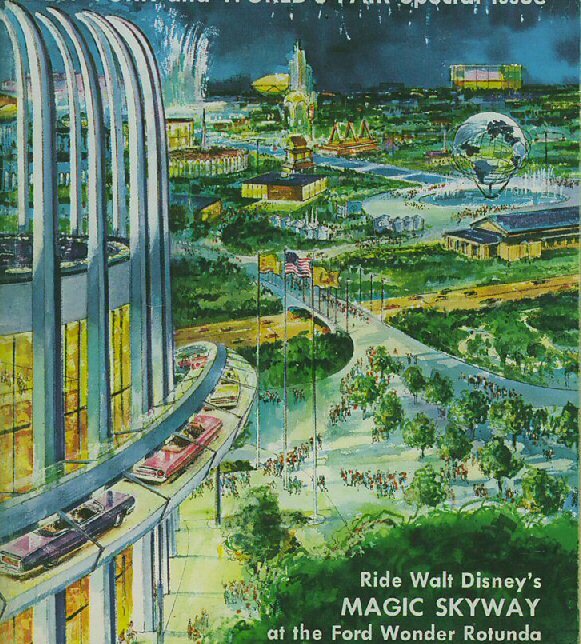 Imagine a "Magic Skyway" ride in modern convertibles to a land where prehistoric animals live anew in Edenlike surroundings and primitive men restage the great inventions of prehistory-a ride that concludes high in a space city of the future. During the first summer of Flushing Meadow's rebirth, over 6,600,000 visitors entered the Ford pavilion beneath its soaring, curving columns, and those people who spoke up to pollsters listed it as one of the great hits of the Fair. The visitors came in such numbers and stepped so willingly into relentless lines to see the Ford-Disney show that the pavilion was filled to capacity virtually the whole first summer. As a result, Ford has taken advantage of the wintertime lull to provide easier access so that it can handle even greater crowds more quickly. The second six-month season of the Fair finds Ford offering visitors a choice of two identical main entrances to its Magic Skyway ride - or a third "no waiting" entrance to its dream car show, art exhibition, and rest areas. The cool comfort of the airconditioned Ford pavilion, with its unique bucket seat lounge chairs for the Fair patron who's just looking for a comfortable place to sit down, was another factor in building Ford's reputation as a host. That reputation was borne out by countless comments received from Fair visitors who lauded the look, the comfort and the entertainment they found at the pavilion. There were bouquets, too, for the boys and girls in yellow-hosts and hostesses Ford recruited from college campuses across America and abroad-whose bright uniforms became a symbol of cheery hospitality. The impact of the Ford pavilion has been felt in many ways. A New York radio disc jockey taped a series of "sounds heard at the Ford pavilion," including the strange language of cavemen, the roar of battling dinosaurs to the accompaniment of crashing thunder, the squeals of youngsters caught up in the excitement of the rainbow-like "time tunnels," and the music of many lands as heard in the exotic surroundings of Ford's "International Gardens."